#Eval13 It’s Going to be a Banner Year! Call me a nerd, but I have the tune “It’s the Most Wonderful Time of the Year” stuck in my head. I’m already in the DC area, having traveled here early to enjoy a few days with family before checking into the Washington Hilton for Evaluation 2013. The American Evaluation Association’s annual conference is truly a joy and a pleasure for me, both for the tremendous professional learning it offers and the abundance of networking opportunities with the evaluation community. First up for me for conference week is Evaluation-Specific Methodology, a professional development course with the formidable and indefatigable Michael Scriven. I’ll be there with my copy of The Future of Evaluation in Society: A Tribute to Michael Scriven in hopes of getting started on reading it in the evenings and going home with the “tributee’s” autograph. Rounding out the conference will be another professional development session with John Gargani, Beyond the Basics of Program Design: A Theory-Driven Approach. In between…who knows? 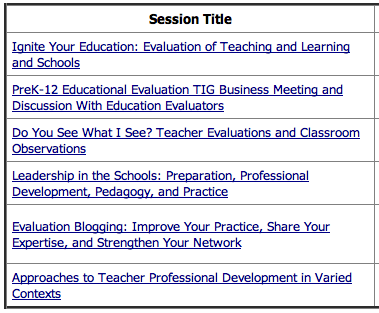 I’m always amazed at the diversity of evaluation-related topics and hundreds of sessions from which to choose for my open times. I’m looking forward to synthesizing and sharing new learning here in the coming week, and live tweeting @sheilabrobinson from the conference. One of the small but significant aspects of #eval13 that I enjoy is the large type name tags. I’ve been able to approach and meet many of the evaluators whose worked I’ve appreciated, and I met my first evaluator friend this way. I recognized her name from an aea365 post I liked, and approached her as we both waited to enter a session. I had traveled alone to the conference, and after that, found myself someone to hang out with! If you see me at the conference, please say hello or stop by one of my sessions. I’d love to meet you!